One Christmas eve Joel Baker was in a most unhappy mood. He was lonesome and miserable; the chimes making merry Christmas music outside disturbed rather than soothed him, the jingle of the sleigh-bells fretted him, and the shrill whistling of the wind around the corners of the house and up and down the chimney seemed to grate harshly on his ears. "Humph," said Joel, wearily, "Christmas is nothin' to me; there was a time when it meant a great deal, but that was long ago—fifty years is a long stretch to look back over. There is nothin' in Christmas now, nothin' for me at least; it is so long since Santa Claus remem-bered me that I venture to say he has forgotten that there ever was such a person as Joel Baker in all the world. It used to be different; Santa Claus used to think a great deal of me when I was a boy. Ah! Christmas nowadays ain't what it was in the good old time—no, not what it used to be." As Joel was absorbed in his distressing thoughts he became aware very suddenly that somebody was entering or trying to enter the room. 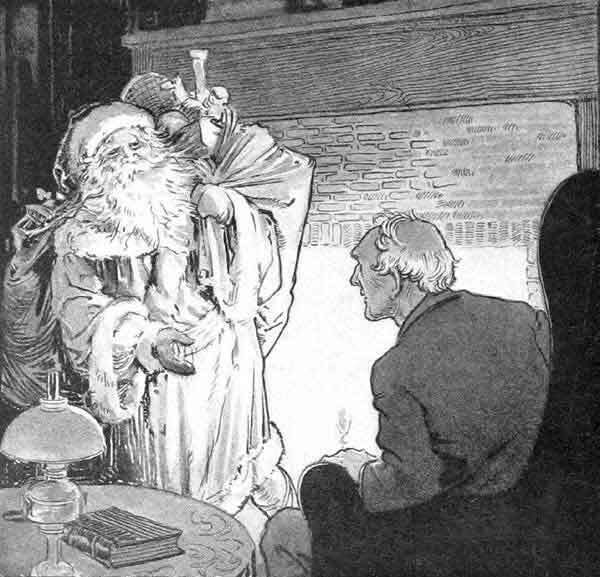 First came a draught of cold air, then a scraping, grating sound, then a strange shuffling, and then,—yes, then, all at once, Joel saw a pair of fat legs and a still fatter body dangle down the chimney, followed presently by a long white beard, above which appeared a jolly red nose and two bright twinkling eyes, while over the head and forehead was drawn a fur cap, white with snowflakes. "Ha, ha," chuckled the fat, jolly stranger, emerging from the chimney and standing well to one side of the hearth-stone; "ha, ha, they don't have the big, wide chimneys they used to build, but they can't keep Santa Claus out—no, they can't keep Santa Claus out! Ha, ha, ha. Though the chimney were no bigger than a gas pipe, Santa Claus would slide down it!" It didn't require a second glance to assure Joel that the new-comer was indeed Santa Claus. Joel knew the good old saint—oh, yes—and he had seen him once before, and, although that was when Joel was a little boy, he had never forgotten how Santa Claus looked. Nor had Santa Claus forgotten Joel, although Joel thought he had; for now Santa Claus looked kindly at Joel and smiled and said: "Merry Christmas to you, Joel!" "Thank you, old Santa Claus," replied Joel, "but I don't believe it's going to be a very merry Christmas. It's been so long since I've had a merry Christmas that I don't believe I'd know how to act if I had one." "Let's see," said Santa Claus, "it must be going on fifty years since I saw you last—yes, you were eight years old the last time I slipped down the chimney of the old homestead and filled your stocking. Do you remember it?" "I remember it well," answered Joel. "I had made up my mind to lie awake and see Santa Claus; I had heard tell of you, but I'd never seen you, and Brother Otis and I concluded we'd lie awake and watch for you to come." Santa Claus shook his head reproachfully. "That was very wrong," said he, "for I'm so scarey that if I'd known you boys were awake I'd never have come down the chimney at all, and then you'd have had no presents." "But Otis couldn't keep awake," explained Joel. "We talked about everythin' we could think of, till father called out to us that if we didn't stop talking he'd have to send one of us up into the attic to sleep with the hired man. So in less than five minutes Otis was sound asleep and no pinching could wake him up. But I was bound to see Santa Claus and I don't believe anything would've put me to sleep. I heard the big clock in the sitting-room strike eleven, and I had begun wonderin' if you never were going to come, when all of a sudden I heard the tinkle of the bells around your reindeers' necks. Then I heard the reindeers prancin' on the roof and the sound of your sleigh-runners cuttin' through the crust and slippin' over the shingles. I was kind o' scared and I covered my head up with the sheet and quilts—only I left a little hole so I could peek out and see what was goin' on. As soon as I saw you I got over bein' scared—for you were jolly and smilin' like, and you chuckled as you went around to each stockin' and filled it up." "Yes, I can remember the night," said Santa Claus. "I brought you a sled, didn't I?" "Yes, and you brought Otis one, too," replied Joel. "Mine was red and had 'Yankee Doodle' painted in black letters on the side; Otis's was black and had 'Snow Queen' in gilt letters." "I remember those sleds distinctly," said Santa Claus, "for I made them specially for you boys." "You set the sleds up against the wall," continued Joel, "and then you filled the stockin's." "There were six of 'em, as I recollect?" said Santa Claus. "Let me see," queried Joel. "There was mine, and Otis's, and Elvira's, and Thankful's, and Susan Prickett's—Susan was our help, you know. No, there were only five, and, as I remember, they were the biggest we could beg or borrer of Aunt Dorcas, who weighed nigh unto two hundred pounds. Otis and I didn't like Susan Prickett, and we were hopin' you'd put a cold potato in her stockin'." "But Susan was a good girl," remonstrated Santa Claus. "You know I put cold potatoes only in the stockin's of boys and girls who are bad and don't believe in Santa Claus." "At any rate," said Joel, "you filled all the stockin's with candy and pop-corn and nuts and raisins, and I can remember you said you were afraid you'd run out of pop-corn balls before you got around. Then you left each of us a book. Elvira got the best one, which was 'The Garland of Frien'ship,' and had poems in it about the bleeding of hearts, and so forth. Father wasn't expectin' anything, but you left him a new pair of mittens, and mother got a new fur boa to wear to meetin'." "Of course," said Santa Claus, "I never forgot father and mother." "Well, it was as much as I could do to lay still," continued Joel, "for I'd been longin' for a sled, an' the sight of that red sled with 'Yankee Doodle' painted on it jest made me wild. But, somehow or other, I began to get powerful sleepy all at once, and I couldn't keep my eyes open. The next thing I knew Otis was nudgin' me in the ribs. 'Git up, Joel,' says he; 'it's Chris'mas an' Santa Claus has been here.' 'Merry Chris'mas! Merry Chris'mas!' we cried as we tumbled out o' bed. Then Elvira an' Thankful came in, not more 'n half dressed, and Susan came in, too, an' we just made Rome howl with 'Merry Chris'mas! Merry Chris'mas!' to each other. 'Ef you children don't make less noise in there,' cried father, 'I'll hev to send you all back to bed.' The idea of askin' boys an' girls to keep quiet on Chris'mas mornin' when they've got new sleds an' 'Garlands of Frien'ship'!" Santa Claus chuckled; his rosy cheeks fairly beamed joy. "Otis an' I didn't want any breakfast," said Joel. "We made up our minds that a stockin'ful of candy and pop-corn and raisins would stay us for a while. I do believe there wasn't buckwheat cakes enough in the township to keep us indoors that mornin'; buckwheat cakes don't size up much 'longside of a red sled with 'Yankee Doodle' painted onto it and a black sled named 'Snow Queen.' We didn't care how cold it was—so much the better for slidin' downhill! All the boys had new sleds—Lafe Dawson, Bill Holbrook, Gum Adams, Rube Playford, Leander Merrick, Ezra Purple—all on 'em had new sleds excep' Martin Peavey, and he said he calculated Santa Claus had skipped him this year 'cause his father had broke his leg haulin' logs from the Pelham woods and had been kep' indoors six weeks. But Martin had his ol' sled, and he didn't hev to ask any odds of any of us, neither." "I brought Martin a sled the next Christmas," said Santa Claus. "Like as not—but did you ever slide downhill, Santa Claus? I don't mean such hills as they hev out here in this new country, but one of them old-fashioned New England hills that was made 'specially for boys to slide down, full of bumpers an' thank-ye-marms, and about ten times longer comin' up than it is goin' down! The wind blew in our faces and almos' took our breath away. 'Merry Chris'mas to ye, little boys!' it seemed to say, and it untied our mufflers an' whirled the snow in our faces, jist as if it was a boy, too, an' wanted to play with us. An ol' crow came flappin' over us from the cornfield beyond the meadow. He said: 'Caw, caw,' when he saw my new sled—I s'pose he'd never seen a red one before. Otis had a hard time with his sled—the black one—an' he wondered why it wouldn't go as fast as mine would. 'Hev you scraped the paint off'n the runners?' asked Wralsey Goodnow. 'Course I hev,' said Otis; 'broke my own knife an' Lute Ingraham's a-doin' it, but it don't seem to make no dif'rence—the darned ol' thing won't go!' Then, what did Simon Buzzell say but that, like's not, it was because Otis's sled's name was 'Snow Queen.' 'Never did see a girl sled that was worth a cent, anyway,' sez Simon. Well, now, that jest about broke Otis up in business. 'It ain't a girl sled,' sez he, 'and its name ain't "Snow Queen"! I'm a-goin' to call it "Dan'l Webster," or "Ol'ver Optic," or "Sheriff Robbins," or after some other big man!' An' the boys plagued him so much about that pesky girl sled that he scratched off the name, an', as I remember, it did go better after that! "About the only thing," continued Joel, "that marred the harmony of the occasion, as the editor of the Hampshire County Phoenix used to say, was the ashes that Deacon Morris Frisbie sprinkled out in front of his house. He said he wasn't going to have folks breakin' their necks jest on account of a lot of frivolous boys that was goin' to the gallows as fas' as they could! Oh, how we hated him! and we'd have snowballed him, too, if we hadn't been afraid of the constable that lived next door. But the ashes didn't bother us much, and every time we slid side-saddle we'd give the ashes a kick, and that sort of scattered 'em." The bare thought of this made Santa Claus laugh. "Goin' on about nine o'clock," said Joel, "the girls come along—Sister Elvira an' Thankful, Prudence Tucker, Belle Yocum, Sophrone Holbrook, Sis Hubbard, an' Marthy Sawyer. 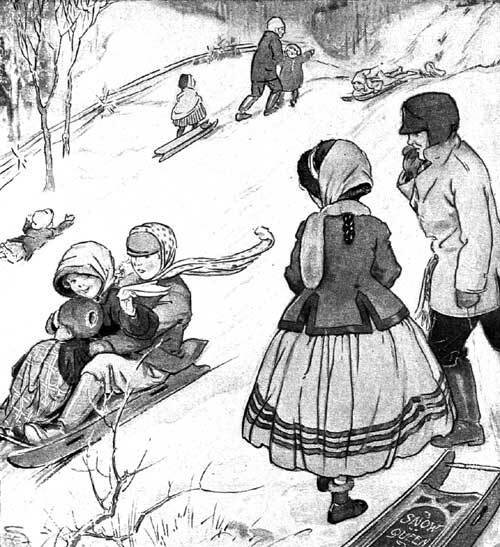 Marthy's brother Increase wanted her to ride on his sled, but Marthy allowed that a red sled was her choice every time. 'I don't see how I'm goin' to hold on,' said Marthy. 'Seems as if I would hev my hands full keepin' my things from blowin' away.' 'Don't worry about yourself, Marthy,' sez I, 'for if you'll look after your things, I kind o' calc'late I'll manage not to lose you on the way.' Dear Marthy—seems as if I could see you now, with your tangled hair a-blowin' in the wind, your eyes all bright and sparklin', an' your cheeks as red as apples. Seems, too, as if I could hear you laughin' and callin', jist as you did as I toiled up the old New England hill that Chris'mas mornin'—a-callin': 'Joel, Joel, Joel—ain't ye ever comin', Joel?' But the hill is long and steep, Marthy, an' Joel ain't the boy he used to be; he's old, an' gray, an' feeble, but there's love an' faith in his heart, an' they kind o' keep him totterin' tow'rd the voice he hears a-callin': 'Joel, Joel, Joel!'" "I know—I see it all," murmured Santa Claus very softly. "Oh, that was so long ago," sighed Joel; "so very long ago! And I've had no Chris'mas since—only once, when our little one—Marthy's an' mine—you remember him, Santa Claus?" "Yes," said Santa Claus, "a toddling little boy with blue eyes—"
"Like his mother," interrupted Joel; "an' he was like her, too—so gentle an' lovin', only we called him Joel, for that was my father's name and it kind o' run in the fam'ly. He wa'n't more'n three years old when you came with your Chris'mas presents for him, Santa Claus. We had told him about you, and he used to go to the chimney every night and make a little prayer about what he wanted you to bring him. And you brought 'em, too—a stick-horse, an' a picture-book, an' some blocks, an' a drum—they're on the shelf in the closet there, and his little Chris'mas stockin' with 'em—I've saved 'em all, an' I've taken 'em down an' held 'em in my hands, oh, so many times!" 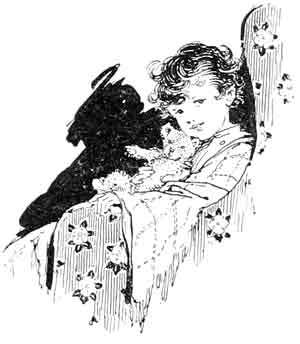 "His little bed was empty, an' I was alone. It killed his mother—Marthy was so tender-hearted; she kind o' drooped an' pined after that. So now they've been asleep side by side in the buryin'-ground these thirty years. "That's why I'm so sad-like whenever Chris'mas comes," said Joel, after a pause. "The thinkin' of long ago makes me bitter almost. It's so different now from what it used to be." "No, Joel, oh, no," said Santa Claus. "'Tis the same world, and human nature is the same and always will be. But Christmas is for the little folks, and you, who are old and grizzled now, must know it and love it only through the gladness it brings the little ones." "True," groaned Joel; "but how may I know and feel this gladness when I have no little stocking hanging in my chimney corner—no child to please me with his prattle? See, I am alone." "No, you're not alone, Joel," said Santa Claus. "There are children in this great city who would love and bless you for your goodness if you but touched their hearts. Make them happy, Joel; send by me this night some gift to the little boy in the old house yonder—he is poor and sick; a simple toy will fill his Christmas with gladness." "His little sister, too—take her some presents," said Joel; "make them happy for me, Santa Claus—you are right—make them happy for me." How sweetly Joel slept! When he awoke, the sunlight streamed in through the window and seemed to bid him a merry Christmas. How contented and happy Joel felt! It must have been the talk with Santa Claus that did it all; he had never known a sweeter sense of peace. A little girl came out of the house over the way. She had a new doll in her arms, and she sang a merry little song and she laughed with joy as she skipped along the street. Ay, and at the window sat the little sick boy, and the toy Santa Claus left him seemed to have brought him strength and health, for his eyes sparkled and his cheeks glowed, and it was plain to see his heart was full of happiness. And, oh! how the chimes did ring out, and how joyfully they sang their Christmas carol that morning! They sang of Bethlehem and the manger and the Babe; they sang of love and charity, till all the Christmas air seemed full of angel voices. Peace on earth, good will tow'rd men!" So all this music—the carol of the chimes, the sound of children's voices, the smile of the poor little boy over the way—all this sweet music crept into Joel's heart that Christmas morning; yes, and with these sweet, holy influences came others so subtile and divine that in its silent communion with them, Joel's heart cried out amen and amen to the glory of the Christmas time.